Education Reform Fodder for Saturday Night Live? The drama of the weather system ripping through New York these last two days was an ample metaphor for the direness of the messages being sent by the education community during Education Nation. Much of the program had to be spontaneously shuffled around due to the weather, and we ended up in the hallowed halls of 30Rock, in the Studio 8H, home of Saturday Night Live, to watch some of the proceedings. 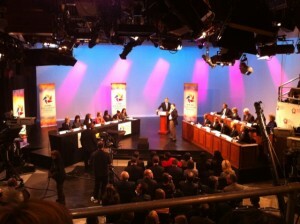 A few of us sitting in the audience wondered if the comedy show might take on Education Nation as the subject of a skit. Someone suggested a sketch with comedians impersonating Michelle Rhee and Randi Weingarten, vocal foes, who had engaged in some heated debates over the past few days during the summit. Wasn’t that too esoteric a subject for the SNL audience? Until now, maybe. But with so much of the media spotlight on education reform from this major network, and with millions of people watching, SNL’s portrayal of the drama would indicate to me that the dialogue has truly permeated the public consciousness.